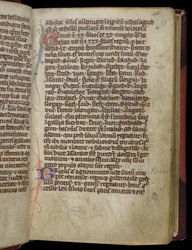 Geoffrey Of Monmouth (c.1100-1154) wrote completed his History it in its final form in 1147. Although it purports to be a book of historical fact, it is more a collection of ancient tales and legends, concerning, for example, King Arthur and Merlin. This manuscript has detailed pencil sketches of a number towns added in some of its margins; these are exceptionally early examples of eye-witness 'cityscapes'. Some of them seem to have been executed in two stages: first with faint grey pencil, and later with darker brown 'crayon'. The identity of the hilltop castle represented in this sketch in uncertain but the adjacent text concerns 'the town of mount Agned, called at this time the castle of the Maidens, or the Mountain of Sorrow'. There is a Maiden Castle near the border in Cumbria, and another in Dorset.